Imagine that hazardous drinkers really really cared about the price of alcohol. If you increased the price of alcohol just a little bit, they'd stop drinking harmfully. Imagine further that moderate drinkers didn't respond very much to prices: what does it matter to the rich Chardonnay-sipping set if a bottle is $8 or $40? If that were the true state of the world, we would have a very simple solution to alcohol problems: hike excise taxes. Harmful drinkers would stop drinking and would stop doing alcohol-related harmful things; moderate drinkers would pay more but that would just be tax revenue for the government. Since they wouldn't change their consumption by very much, deadweight costs would be pretty small relative to the harms avoided. Yay taxes! Unfortunately, the world don't quite look like that. Our best evidence on it remains Wagenaar's metastudy showing that heavy drinkers respond to a 10% price hike by reducing consumption by 2.8%; average consumption drops by 4.4% with the same price increase. Moderate drinkers respond more to price increases than do heavy drinkers. Even worse, Byrnes et al show that heavy drinkers' price responsiveness mostly comes from their reductions in drinking on low-drinking days: they basically save up to be able to continue binging on the weekend. So their reduction in consumption is in the part of their consumption that does the least harm. Boo taxes! Enter the NZ Government report on excise and minimum pricing. Fortunately, the Minister has more sense than her Ministry and hasn't gone ahead with minimum pricing; hopefully, she's not looking at excise. What's the problem with the report? They started by assuming that heavy drinkers are more responsive to prices than are moderate drinkers. And they know it's wrong. Here, at Table 5, they show the general consensus of the international literature: heavy drinkers don't respond to prices nearly as strongly as do moderate drinkers. The Wagenaar numbers vary a bit from the -0.44 that I tend to cite as average; I usually go for the weighted measure. Bottom line: heavy drinkers are roughly half as responsive to prices as are moderate drinkers. That's page 20. And they cite Byrnes accurately at page 21. But then what do they go and do? They started by trying to get SHORE to estimate NZ elasticities, but something went wrong there: the elasticities were completely out of whack with reality. Reading between the lines at page 25, it looks like SHORE was using the increase in purchases of products on special at supermarkets as part of its price elasticity estimation, and that just ain't right. If you switch brands because something's on special and buy more of it than you otherwise would have, that isn't the same effect as you'd expect for across-the-board price changes you get with excise or minimum pricing. "It was decided that the significant reductions in consumption estimated using NZ elasticity estimates are not a realistic representation of what is likely to happen in reality and are contrary to all international evidence of the responsiveness of alcohol consumers to changes in price." Rather than discard the completely nuts NZ numbers, they let those figures stand and added alternative numbers as robustness checks. Those big headline estimates you've been seeing in the papers about just how awesome excise is? They're based on the numbers that, according to the report, "are not a realistic representation in reality and are contrary to all international evidence of the responsiveness of alcohol consumers to changes in price." Example? A 133% excise hike means about a 40% increase in the cost of low-priced beer, a 44% increase in the cost of low-priced wine, a 45% increase in the cost of low-priced RTDs, and a 103% increase in the price of low-cost spirits. The heavy drinkers SHORE estimated a 61% reduction in harmful consumers' consumption with that tax hike. So they're saying that harmful consumers are more than unit elastic. That's just not right. The other problem with the SHORE numbers is that they couldn't distinguish between heavy and moderate drinkers. Everybody's elasticity was equally overestimated. Because those numbers were so out of whack, they also ported in some Sheffield elasticity estimates from the UK. Problem with those estimates is that, while they're about right on average, they've messed up the relative elasticities: they have harmful drinkers being more price responsive than moderate drinkers. I'm not sure why they didn't pull in the 2008 Sheffield estimates noted at Table 5. At Table 25 they say, using Sheffield, that a 133% excise increase would reduce low risk consumption by 18.6% while reducing harmful consumption by 21%. If that 133% excise increase corresponds to about a 45% price increase, then Wagenaar's estimates would say we'd get only a 12.6% decrease in heavy consumption and a 28% decrease in moderate drinkers' consumption (using the figures from Table 5). Heavy drinkers' real-world price responsiveness is 60% of that advertised, while moderate drinkers' responsiveness is 150% of their figures. Overall it appears that excise increases have a greater impact on harmful drinkers than low risk drinkers, based on University of Sheffield elasticity estimates. This is driven by the greater own-price elasticities, particularly for spirits. However, this result is inconsistent with findings in studies such as Wagenaar et al (2009), which found that heavy drinkers are much less responsive to price changes (with an elasticity of -0.28 compared to -0.62 for all drinkers). The University of Sheffield also found that harmful drinkers are much more price inelastic compared to low risk drinkers when total alcohol consumption was considered, rather than consumption by beverage type. We also do not have separate elasticities for per occasion drinking, and recent evidence indicates that people are much less price responsive during drinking occasions (Byrnes et al, 2012). Therefore there is a risk that the effects on purchases could have been over-estimated for per occasion purchases. Therefore we cannot conclude with confidence that excise increases will have a greater impact on harmful drinkers. More research is needed to confirm this, which could be done once revised University of Sheffield elasticity estimates are available. Crime reduction benefits are overestimated both because heavy drinkers are modelled as being far more price responsive than they really are and because crime seems more responsive to binge drinking than to longer term heavy drinking, and it's the latter that seems more affected than the former among heavy drinkers. The health effects will be overestimated where harmful drinkers are modelled as sharply curtailing consumption and where we underestimate by how much moderate drinkers shift into non-drinking and miss out on the health benefits of moderate drinking. The deadweight costs facing moderate consumers are underestimated in the Sheffield figures that understate moderate drinkers' consumption elasticity. All the other benefits that require consumption reductions among heavy drinkers will also be overstated. Tables 40 and 41 have a whole whack of sensitivity checks. What if population growth is lower or higher? What if we use a higher or lower discount rate? Nowhere in the 21 sensitivity analyses is the one that really matters: "What if we use a sane, international-consensus measure of relative price elasticities?" Whether this is enough to overturn their net benefits finding - I can't tell without a pretty extensive bit of work. Just linear extrapolations from the changes in harmful and moderate consumption won't do it: deadweight costs will increase extraproportionately, and harms are likely exponential in heavy consumption. * But I'm pretty sure that Collins was dead right in not relying on this stuff to justify imposing minimum pricing: the case hasn't been made. They estimate the productivity costs of those showing up to work with hangovers under the assumption that those prone to showing up to work with hangovers have average productivity characteristics but for their propensity to show up for work with hangovers. I rather suspect that less conscientious workers are more prone to showing up unfit for duty, and that this affects more than just hangovers. They estimate the productivity costs of taking a day off for a hangover under the assumption that the kinds of people who take a sickie for a hangover wouldn't have used up that free sick day for some other recreational purpose later in the year. This also seems implausible. Their analysis of alcohol-related unemployment is bereft of consideration of comorbidity between alcoholism and depression and the independent effect of underlying characteristics on employment. Frictional costs to employers of replacing fired or deceased workers seem predicated on an assumption that the employer would never otherwise have to have replaced that worker. Their crime estimates count as an alcohol-caused crime any crime committed by someone arrested within 12 hours of offending and presenting as at least moderately intoxicated. While this may underestimate things by excluding those who aren't caught until much later, it also says that every one of those moderately intoxicated arrestees would never have committed the offence but for the alcohol. Not sure which way things will cut on that one, but I'm awfully sure that they'd do better by just porting in some decent estimates of the elasticity of crime with respect to alcohol out of something like Carpenter. I'll be interested to see what they come up with when they have a second go at this, with some sane elasticity figures. On the plus side, Footnote 31 points to my blog post on likely effects of minimum prices on producers. I'd have recommended this one instead. * At Table 37, they give a $268,185,000 cost of a 133% excise hike. If moderate consumers are 150% as responsive as they're reckoning, then a linearisation would put that cost up to $402 million. At Table 30, they give a value of harm reduction in Year 1 of $740,344,000. If heavy consumers are only 60% as price responsive as they're reckoning and if harms were linear, that knocks the benefits down to $444m. So we're down to a net benefit of about $40 million, without considering that deadweight costs will be higher than implied by linearisation, and without considering the other problems noted above. Whether the linearisation on harms here overstates or understates things gets complicated: for any individual drinker, harms are strongly non-linear, so if we had a pile of really really heavy drinkers estimated to become moderate drinkers, but instead only become heavy drinkers, then my linearisation overestimates how much the report overstates harm reduction: the reduction in harm in moving from really really heavy drinking to heavy drinking is bigger than the reduction in harm from moving from heavy to moderate drinking. But if instead we get the harm reduction from greater proportions of heavy drinkers shifting into moderate drinkers than really would, then the linearisation would be about right. And if prices are really bad at hitting acute drinking that contributes most greatly to harms, then even my linearisation understates the extent to which the report overstates harm reduction. It's complicated, and I haven't access to the guts of this machine. Now, in the first long-term study, Massey University researchers Dr Taisia Huckle and Karl Parker have found this increased risk has become the new normal. In the years leading up to the change, drivers aged 18 or 19 had roughly the same chances as those aged 20 to 24 of having an "alcohol-involved" vehicle crash that caused injury or death. That increased in the years following the change, putting the younger drivers at 15 per cent greater risk in the first six years, then at 21 per cent greater risk up to 2010. Loyal readers will recall Steve Stillman's work with Stefan Boes showing the opposite: they concluded that there was no increase in crash risk for 18 and 19 year olds after the purchase age change. First, the two studies are looking at different things. Huckle et al at SHORE use the ratio of alcohol-involved to non-alcohol crashes as dependent variable. They argue that this helps to control for the rate of non-alcohol-related crashes. They look at how this ratio for 18-19 year olds changes as compared to the similar ratio for older cohorts after the crash. If the ratio increases, that's potentially a form of difference-in-difference analysis that says something about the effects of the law change. They found that the ratio increased for youths relative to older cohorts. Stillman and Boes instead looked at the number of alcohol-related crashes among 18-19 year olds as compared to alcohol-related crashes among older cohorts. They found no increase in the number of alcohol-related crashes for youths relative to adults once you put in appropriate time trends. One problem with using ratios as dependent variable, and especially when you're using it in difference-in-difference comparison to another ratio, is that you can't easily tell whether any significant effect of the intervention was due to changes in alcohol-related youth accidents, non-alcohol-related youth accidents, alcohol-related adult accidents, or non-alcohol-related adult accidents. If non-alcohol-related accidents changed for other reasons around the time of the policy change, and if youths responded to that differently than adults, then that could have driven results. Because the ratio measure isn't clean, it's then harder to talk about the "risk" of an alcohol-involved crash for youths subsequent to the change. You could say that the ratio has changed, but it's hard to say why. Stillman's paper pretty clearly shows that the "why" wasn't an increase in alcohol-involved accidents among 18-19 year olds. Further, and as Thomas Lumley points out, while the paper says there was no effect on fatalities, each tragic anecdote in the Herald piece involved a fatality; the Herald story nowhere mentioned that SHORE found nothing on fatalities. The SHORE paper said "Lowering the purchase age had no impact on fatal alcohol-involved crashes among drivers aged 18 to 19 years compared with drivers aged 20 to 24 years." I'm a bit curious why the Herald then chose to lead with "Lowering the alcohol purchase age has been linked to a long-term increase in the chance of drunk drivers aged 18 or 19 being involved in car crashes that cause death or injury." "There’s more to neoliberal hegemony than loss-leader pricing, but as ideological combatants those people know what they’re doing." Chances are the archive volunteers never contacted the press before putting the material up because they assumed, reasonably enough, that an edition prepared largely if not entirely with the support of old-fashioned, Soviet-era Moscow gold was not anybody’s private intellectual property—that the works of Marx and Engels now belong to the commons. They just want people to be able to read Marx and Engels. About the time the Marxist Internet Archive announced that it would be taking down all theMECW material, Corey and I both, by coincidence, were ourselves of radically under-priced materials from the enemy’s publishing apparatus. He’d received an order containing dirt-cheap copies of Bastiat from the Liberty Fund, while a day earlier I had downloaded free digital editions of the major Austrian School books on theory of value and the socialist-calculation debate from the Mises Institute website. There’s more to neoliberal hegemony than loss-leader pricing, but as ideological combatants those people know what they’re doing. One side of the war of ideas recognizes the value of supplying free ammunition to its allies. The other side will charge its own side for each bullet. Interesting which side's chosen which strategy. The interested reader can also find all three volumes of Das Kapital at Liberty Fund. If you've not perused the Online Library of Liberty, or Mises.org's extensive selection, they're both well work a browse. All it will cost you is your time. Fifty-five percent of the people in my neighbourhood have no religion, while thirty-nine percent identify as Christian. My daughter's Jedi status I guess is part of the remaining 6%. The Christchurch Press puts up the map, though I'm not sure whether the map is theirs or comes from elsewhere; the GoogleDoc has "attribution unknown". As it's from a Google Doc, I've embedded it below. I didn't know that you could have Google do this kind of thing; it's amazing. Were I not a bit swamped with other projects, it would be really rather fun to copy the spreadsheet and add in columns for income, education and ethnicity. I was surprised to see that the east side of Christchurch was so irreligious; the usual stereotype has places with strong Pacific island migrant communities, like Aranui, being pretty religious. But Christchurch's godly folks live out West in the richer parts of town like Fendalton. It would also be neat to overlay changes from 2006 to 2013 with relative earthquake damage. American kids tend to be born June through September. I'd thought this was generally due to parents planning to hit a September school enrolment cut-off day: in many US states, if your child turns 5 at or before the start of school in September, the kid's enrolled; otherwise, you've got another year of daycare to worry about. Buckles and Hungerman showed that seasonality in births is due to deliberate timing: women who were trying to conceive showed strong seasonality, while those for whom births were unexpected showed no seasonality. In New Zealand, your child starts school on the fifth birthday. If the child is born before a cut-off date (end-March, but later at most schools), he or she will start straight into Year 1. If the birthday is later in the year, the kid starts in Year 0 then either progresses to Year 1 at the start of the new school year in February, or continues in Year 0 until ready for Year 1. Incentives facing Kiwi parents are then a bit different. Since your kid is in school on the fifth birthday no matter what, you don't have to worry about hitting that barrier. But you might want to avoid a protracted stay in Year 0 unless you want your child to be old for his class. If you want to have your kid start straight into Year 1, you'd time your birth for the Kiwi summer or autumn; if you want your kid to start in Year 0 and dominate his later classmates on the rugby pitch, you'd time it for a spring Year 0 start. StatsNZ today put up a table showing the most common birthdays and linked to a great visualisation of the US data. 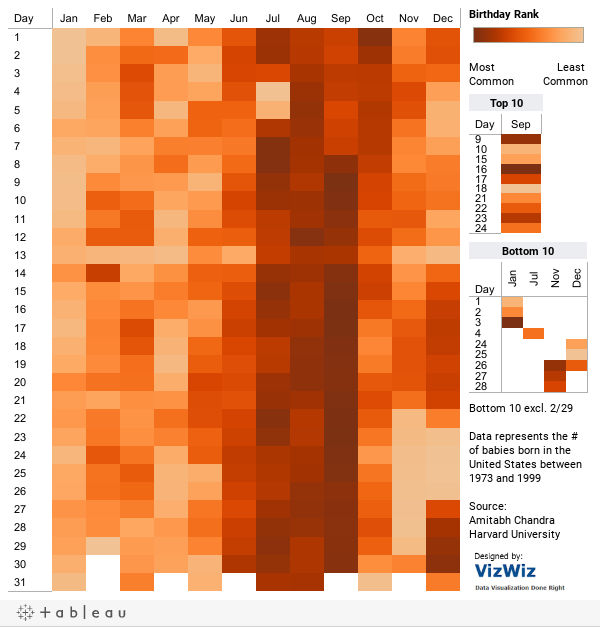 In both cases, the heatmap shows the frequency of particular birth dates. Where Americans tend to be born June-September, Kiwi births cluster September-October. Those kids would get a short start in Year 0 before progressing to Year 1 when school starts in February. We hadn't really considered school timing when beginning the Ira and Eleanor production processes. I expect that the Kiwi data reflects deliberate timing decisions like those found in the US. I'm just a bit curious what's underlying those decisions. Kiwis avoid June the same way that Americans avoid January, but the only sense I can make for Kiwi preferences for spring over fall is differences in school timing. But there are disadvantages to being part of the cluster. Maternity wards have only so much capacity. If you're giving birth at the same time as everybody else, you're likely going to be pushed home rather more quickly than you'd like. Pointers to the relevant literature, or Kiwi common knowledge, are welcome. The Egg Day Out was held across three locations in Auckland on Good Friday. It was organised by the Equippers church and sponsored by Cadbury. A thousand eggs were to be dropped at each location from a helicopter for children to "hunt" and gather. All went to plan at the city and North Shore locations but in Manukau at the Vodafone Events Centre air traffic control prevented the chopper from flying over the site and the eggs were scattered by hand. Equippers pastor Wilhem Schaafhausen told the Herald he had expected up to 5000 people to attend at each site, but on the day about 30,000 showed up. He said one of the problems at the event was the behaviour of many parents. "A lot of kids were getting hurt ... parents were just running in and running over the kids. I was like 'oh my goodness' and my volunteers were blown away by the behaviour of the parents," he said. ...They described other parents as greedy and abusive and said they were trying to get as many eggs as possible. Yvonne Pokotai-Ratana took her daughters to the event with some friends and their own kids. She said an adult set upon her younger daughter Yves to take any eggs she had collected. "There was a point where the adults weren't allowed to access beyond, only the children. But arrogant adults ignored the commentator," she told the Herald. "When the egg drop started the crowd of kids and adults rushed up the hill - most of whom I saw were adults being rough to others around them just to get the Easter eggs. My 7-year-old's face was scratched by an adult and she didn't even have an egg. Other children walking past were crying or even hurt." A woman posted on the Facebook page that she ended up in the accident and emergency department with her young son after an incident at the event. "Thanks for the A&E visit for my 3-year-old [after] getting pushed by adults and his fingers getting trampled on after egg ripped out of his hand," she wrote to organisers. We know that chocolate is addictive. And look at the lengths to which even adults will go when chocolate-crazed. Events like this encourage precisely this kind of behaviour: a chocolate free-for-all. Clearly we need to ban free-chocolate events. But that isn't enough. Our obesity problems combined with this kind of mayhem point strongly towards tougher regulations on access to chocolate and chocolate minimum pricing. We need many hundred-thousand-dollar grants to the University of Otago's and University of Auckland's public health departments examining binge chocolate eating. They'll surely find that we're in a deep crisis and that More Must Be Done. We could establish Chocolate Healthwatch to send out anti-chocolate press releases every Easter and Halloween. Or maybe we could instead start recognizing that there are just some real jerks out there and deal with the more general jerk problem. It would be ridiculous to start some anti-chocolate campaign on the basis of this weekend's event; it would be rather more appropriate to have parents go through their videos of the event, find the adults who were behaving like this, put their pictures up everywhere, and shame them for their loutish, awful behaviour. Would that we could take an individual responsibility approach more broadly. Despite Kiwi secularism, New Zealand still has odd rules around shops and bars being open on Good Friday and Easter Sunday. But, if there's a special event on, you're supposed to be able to get a special licence to keep your bar open. Warbirds Over Wanaka comes to Wanaka every other year. Fifty thousand showed up in Wanaka (population 7000) to watch the airshow. It's a pretty big deal for Wanaka. You might even think it would count as a special event. Disappointed Wanaka bar operators have been given a resounding ''no'' to requests for special liquor licences at Easter, leaving a 50,000-strong Warbirds Over Wanaka airshow crowd with nowhere to drink in the resort unless they are dining. The Queenstown Lakes District Licensing Committee refused special licence applications for Good Friday and Easter Sunday from eight Wanaka bars and one Queenstown bar at hearings in Frankton on Monday and Wanaka yesterday. The applications had been opposed by Public Health South medical officer of health Dr Derek Bell and Sergeant Linda Stevens, of Queenstown police, who said despite claims to the contrary, the bars were essentially proposing ''business as usual'', not genuine events as required for special licences under the Sale and Supply of Alcohol Act 2012. Fifty thousand people showing up wasn't enough for it to count as a special event; apparently, had the bars coordinated with Warbirds to have plane-themed stuff going on at the bars, they could have opened for the weekend. Post Office Lane bars manager Tom Wild said Wanaka businesses relied heavily on seasonal trends, particularly Easter, which came immediately before a long, quiet shoulder season. Warbirds provided an opportunity for bars to ''showcase'' Wanaka as an attractive tourist destination to the thousands of visitors in the area. However, because people wanting a night out would be denied that option and restaurants allowed to trade would struggle to cope with the huge numbers, visitors were likely to form a negative opinion of their time in Wanaka, Mr Wild said. It seemed inconsistent that Post Office Lane bars Woody's and Barluga had been granted special licences during the 2012 Warbirds, when there was ''substantially less'' entertainment than the three-day ticketed music event proposed this Easter, he added. Wanaka bars had tried to ''dress up'' their applications as separate events to cater for the large Warbirds crowd, yet in reality, there would be ''no significant differences'' in the food, drinks, ambience and music provided at those events compared with regular trading days. Evidence for that could be found in the ''dulling sameness'' of the applications, the intention to trade for a large part of the prohibited days rather than a ''gentle intrusion'', the lack of significant entry fees for the bars' proposed events and the fact licensees had made no attempts to co-ordinate with Warbirds' organisers. Bar operators had two years between each airshow to plan a complementary event and Mr Unwin hoped for a ''much more significant form of co-operation so there will be an event within the event'' in future. So, by whim of retired judge Bill Unwin, if next time around the applications are more interesting and don't suffer from "dulling sameness", maybe the bars will be allowed to open. Or maybe they won't. The bar owners don't get to try to figure out what kind of thing customers might want during Warbirds; Unwin gets to. Great system. Shopped at Oderings today. Would have gone yesterday, but decided to support their civil disobedience. @seamus_hogan But why is it illegal for them to sell to me, but not illegal for me to buy from them? I smell the mercantilist fallacy. The Cramptons instead spent Easter in the pools at Hamner Springs. Note that the green waterslide can be very fast indeed. College grads earn more than those who don't go to college. Does it follow that governments should encourage more kids into university? Not necessarily. Let me illustrate. Suppose you're at the 90th-percentile of high school graduates, so your probability of graduating college if you enroll is around 90%. When the college premium ascends from 50% to 70%, your expected premium goes from 45% to 63%. In plain English, the payoff goes from very good to excellent. Either way, enrollment is a no-brainer. If instead you're at the 25th-percentile of high school graduates, your probability of graduating college if you enroll is around 20%. When the college premium ascends from 50% to 70%, your expected premium goes from 10% to 14%. In plain English, the payoff goes from really crummy to crummy. Either way, non-enrollment is a no-brainer... especially when you dwell on the fact that colleges don't refund drop-outs' tuition, much less the earnings and work experience they forfeited to attend. My favorite feature of Eberly-Athreya: Their story readily generalizes to other weighty life choices widely seen as "no-brainers." Conventional wisdom condemns dropping out of high school. After all, standard estimates say that finishing high school raises your income by 50%. For good students, it's easy money. For stereotypical "bad students," though, it's hard money - or a waste of money. Why? Because when bad students attend high school, their probability of graduation - and their expected return - remains fairly low. The same holds for marriage. The economic benefits of stable marriage are massive. But as Charles Murray explains, the probability of stable marriage varies widely by social class. Divorce rates for the working class are about four times as high as for professionals. Marginal brides and grooms therefore face a high probability of marital failure - and can reasonably fear that marriage will make them worse off despite its palpable benefits. To be fair, Eberly and Athreya are not the first or only education researchers to highlight the chasm between ex ante and ex post returns to education. But as far as I can tell, no one makes the logic clearer. If anyone taunts, "So your kids should go to college, but other people's kids shouldn't," the honest answer is "Don't shoot the messenger - or his kids." The numbers don't lie: College is a great investment for great students, a mediocre investment for mediocre students, and a bad investment for bad students. This mirrors what Wolfers and Stephenson have been saying about the returns to marriage: the decline in marriage among the poor comes down to its lower expected value for poor people. Annick Masselot of Canterbury's Management department wants gender quotas on boards of companies listed on the NZX. UC associate professor Annick Masselot said the NZX should go further with the introduction of quotas. "In fact I think they have a duty to do that . . . Diversity is not an option." She said NZX's diversity rules should at least match rules from the Australian sharemarket that required companies to disclose whether they had a formal diversity policy, and "if not, why not". Masselot said several studies found that having women on boards led to an improvement in financial metrics. Countries including Norway had introduced gender quotas in company boards using hard legislative measures. Others, including Australia had increased the number of women on boards with the use of "soft" self-regulation, she said. The NZX would have the power to introduce gender quotas, but did not consider it appropriate to introduce them and had no intention to do so, a spokeswoman said. I wouldn't be surprised if there were some studies finding benefits, but I doubt that they'd be sufficient to overturn the general conclusion that quotas aren't necessarily that hot an idea. Adams and Ferreira, in the Journal of Financial Economics, found that mandating gender quotas for directors reduces firm value for well-governed firms. Forcing Boards to take on more women can help performance where those firms had existing problems that could be solved by greater Board monitoring. But on average, greater diversity yielded worse firm performance in the set of S&P firms (500, MidCaps and SmallCaps) studied. Given that our previous ﬁndings suggest that more gender-diverse boards have stronger governance, these results imply that, on average, tough boards do not improve ﬁrm value. But they do not imply that tough boards never add value. There is no reason to expect tough boards to add value in all ﬁrms. The value of a tough board should depend on the strength of the other governance mechanisms. If ﬁrms have otherwise strong governance, having a tough board could lead to overmonitoring. But if ﬁrms have otherwise weak governance, we would expect tough boards to be particularly valuable. Our results highlight the importance of trying to address the endogeneity of gender diversity in performance regressions. Although a positive relation between gender diversity in the boardroom and firm performance is often cited in the popular press, it is not robust to any of our methods of addressing the endogeneity of gender diversity. The true relation between gender diversity and firm performance appears to be more complex. We find that diversity has a positive impact on performance in firms that otherwise have weak governance, as measured by their abilities to resist takeovers. In firms with strong governance, however, enforcing gender quotas in the boardroom could ultimately decrease shareholder value. One possible explanation is that greater gender diversity could lead to overmonitoring in those firms. More generally, our results show that female directors have a substantial and value-relevant impact on board structure. But this evidence does not provide support for quota-based policy initiatives. No evidence suggests that such policies would improve firm performance on average. Proposals for regulations enforcing quotas for women on boards must then be motivated by reasons other than improvements in governance and firm performance. However, there is no evidence that it's the names causing such a marked discrepancy, rather than other factors they represent, Clark says. Different names are popular among different social classes, and these groups have different opportunities and goals. "That's something that's emerged in modern England that didn't exist around 1800," he says. When he re-ran his study, but this time looking at students attending Oxford and Cambridge in the early 19th Century, he found the correlation between names and university attendance far less marked. First names simply weren't the social signifiers they are now. What's happened since then is a move towards unusual, even unique, names. Before 1800, Clark says, four first names referred to half of all English men. In 2012, according to the Office for National Statistics, the top four names (Harry, Oliver, Jack, Charlie) accounted for just 7% of English baby boys (and the picture was much the same in Wales). Similarly in the US, in 1950, 5% of US parents chose a name for their child that wasn't in the top 1,000 names. In 2012, that figure was up to 27%. As late as the 18th Century, it wasn't uncommon for parents to call multiple children the same name - two Johns for different grandfathers, for example. Now parents increasingly look for unique names or spellings of names. As Jean Twenge points out in her book the Narcissism Epidemic, Jasmine now rubs shoulders in naming lists with Jazmine, Jazmyne, Jazzmin, Jazzmine, Jasmina, Jazmyn, Jasmin, and Jasmyn. Our baby-naming algorithm, which wound up choosing Eleanor for our girl, started with a domain of names in the top 1000 from 1880 to 1930 in the US, then eliminated any names that were in the top-100 any time in the last three decades. So you rule out the made up stuff while also ruling out having too many classmates with the same name. But we're the kind of people who would choose that kind of algorithm. This paper investigates the question of whether teachers treat children differentially on the basis of factors other than observed ability, and whether this differential treatment in turn translates into differences in student outcomes. I suggest that teachers may use a child's name as a signal of unobserved parental contributions to that child's education, and expect less from children with names that "sound" like they were given by uneducated parents. These names, empirically, are given most frequently by Blacks, but they are also given by White and Hispanic parents as well. I utilize a detailed dataset from a large Florida school district to directly test the hypothesis that teachers and school administrators expect less on average of children with names associated with low socio-economic status, and these diminished expectations in turn lead to reduced student cognitive performance. Comparing pairs of siblings, I find that teachers tend to treat children differently depending on their names, and that these same patterns apparently translate into large differences in test scores. I wish that audit studies instead used a cross-cutting method that would test Da'Quan against Dwayne and Cleetus instead of just against Peter. Put it into a 2x2 matrix with race on one axis and class on the other. First names may just be signals, but "just signalling" hardly means unimportant. If you're economising on time while going through the resumes or university applications, and if a Cleetus is less likely than a Peter to know which fork to use at the important dinner with a client or donor, well, a Cleetus would have to be better than a Peter to get a second look. Because parents who have some minimal social capital expect this to be at least somewhat likely to be true, they make different naming choices than those who don't. The parents who need Crampton’s naming algorithm most will give up long before they hit “Borda count”. I'd tell you to avoid giving your kids dumb names, but if you're reading this, you almost certainly already know it. * I really need to get his book. The interview teasers have been very tempting. Free riding kills voluntary contributions in public good games. When individuals see that free-riders are able to do well, and where there's no way of excluding those free-riders from the benefits of contibutions, or of punishing them, they lower their likelihood of contributing. And so organ donation rates are pretty low. Donors provide a public good: they increase everyone else's chance of getting an organ if they need one, but don't get much out of it other than the knowledge that they're potentially helping others. Non-donors have equal access to organs should they need one. It's a sharing club that doesn't punish members for failing to share; takers gonna take. It isn't a full no-give-no-take system. Instead, donors simply get priority over non-donors. And, beautifully, the families of donors also get priority. Launched in April 2012, the new Israeli system grants first priority for transplants to living donors and the family members of donors—who, in the event of brain death, make the ultimate decision whether to donate their kin’s organs. Registered donors of three years or more receive second priority; family members of registered donors receive a third tier of priority. The system confers an advantage to candidates in the same tier of need; it never enables transplant candidates to supersede needier counterparts. Priority can’t catapult Status 2 recipients into the heart-transplant Status 1 list, but it can take them to the top of Status 2. With other organs, like kidneys, where a point system assigns values weighing age, waiting time, and compatibility create a 0 to 18 score, signing up as a donor can add a 1- to 5-point boost. In 2013, the first full year of the new system, there were a record number of transplants in Israel; meanwhile, transplants received by Israeli patients abroad fell to a quarter of their 2007 peak. Most of what continues is the result of lawful allocations many nations offer foreign transplant candidates. Another feature of the 2008 Organ Transplant Act—full reimbursement to living donors for lost work time, and health and life insurance for five years—has helped spur donations of kidneys, and lobes of liver and lungs. Between 2011 and 2013, the number of Israeli living organ donors increased by 67 percent over the preceding three-year period, and the Israeli transplant waiting list contracted in 2013. It certainly hasn't abolished the waiting list. But it's helped. New Zealand could well save a lot of lives by following the Israeli example. Otago University hand-wringers prefer deaths to incentives; it would be nice if Parliament could pay a bit less attention to them. Compensate cadaveric organ donors with free funerals. It's odd that Otago can cover a cremation subsidy for those leaving their bodies to science, but we can't compensate organ donors for similar donations. Encourage LifeSharers as a way of boosting donation rates rather than try to stomp on it [see also here]. Consider the other steps taken by Israel: priority access to donated organs for those signing on as organ donors. See here and here. Hit the "Organ Markets" tab for all the prior posts on the topic. Under the Affordable Care Act, between six and eleven million workers would increase their disposable income by cutting their weekly work hours. About half of them would primarily do so by making themselves eligible for the ACA's federal assistance with health insurance premiums and out-of-pocket health costs, despite the fact that subsidized workers are not able to pay health premiums with pre-tax dollars. The remainder would do so primarily by relieving their employers from penalties, or the threat of penalties, pursuant to the ACA's employer mandate. Women, especially those who are not married, are more likely than men to have their short-term financial reward to full-time work eliminated by the ACA. Additional workers, beyond the six to eleven million, could increase their disposable income by using reduced hours to climb one of the "cliffs" that are part of the ACA's mapping from household income to federal assistance. As StatsNZ is starting to link up all their individual datasets, we might finally be able to start working out whether New Zealand's Working for Families regime had similar effects on second earners in particular income/child categories. WFF benefits abate with family income and so strongly increase effective marginal tax rates. Since second earners' labour supply is more elastic, this ought to have disproportionately affected female labour supply. It's a Masters thesis waiting to be written. Local Government New Zealand is looking for alternative funding mechanisms. Basing rates on property values alone may soon no longer be sustainable as the sole taxation form for many councils, says Local Government New Zealand (LGNZ). Instead, it would investigate other forms of taxation such as local consumption and local income taxes as "complementary alternatives". The LGNZ Local Government Funding Review comes as an ageing population contributes to an increased number of asset rich/cash poor ratepayers who struggle to pay their rates. Some councils also face major growth pressures to fund large-scale infrastructure investments to meet the needs of future generations and sustain economic growth, with limited funding tools at their disposal. Yule said this would place severe pressure on a pure property tax model. As we've noted before here, there are two very good ways of dealing with this particular problem while maintaining a reliance on property taxes. First, the wealthy elderly could be encouraged to take out a reverse mortgage. These are available in New Zealand. You lose equity in your home, but you pay your taxes. The wealthy elderly would then provide a smaller bequest to their middle-aged kids, but that's hardly the end of the world. So, the problem isn't really that bad, if we're willing to contemplate that ageing property-wealthy-but-cash-poor Boomers might might be called upon to consider paying their bills. Because LGNZ has put taxing the wealthy cash-poor elderly into the too-hard basket, they're starting to draw funding ideas from the too-silly basket. I had a call from Jim Mora's producer asking if I could talk about some of this stuff with The Panel yesterday. I'd written up my notes before noticing that the time clashed with my son's swim lessons and so I wouldn't be able to do it. Stephen Hickson capably filled in for me [hit around the 20 minute mark]. But I'll copy my notes below anyway. Local income taxes are pretty much always a bad idea. If there were a 10 Commandments of Local Government Finance, "Thou Shalt Not Implement A Local Income Tax" would be one of them. Andrei Shleifer and Ed Glaeser had a great paper about a decade ago called "The Curley Effect". The basic model is as follows: where a mayor can use local tax policy to drive out those who would vote against him, he'll do it. And so Coleman Young hiked local income taxes, driving richer voters out of Detroit and funding programmes for his poorer supporters. He also implemented a pretty hefty commuter tax. Detroit's current prosperity owes no small part to his local tax policies. The Curley Effect was named for James Michael Curley, who ran similar policies in Boston to drive out the rich protestants, leaving him with an electorate of poorer Catholics who supported him. Congestion charges are a great idea, if you can make them implementable. They're not a great idea because of the revenue that they raise, though. Rather, they're a great idea because they help fix local congestion issues. Further, they're a great idea because they might help attenuate some of the current opposition to sprawl and densification. If those who wind up contributing to congestion through sprawl and density wind up bearing the bulk of the costs of that through congestion charges, maybe people wouldn't oppose sprawl so much. But, again, the point isn't revenue-raising. Maybe you could put it in instead of hiking other taxes, but the fees should be set entirely to try to get towards optimal levels of congestion rather than to raise money. Where it's seen as a revenue grab, or where it's likely to be a revenue grab instead of a congestion abatement mechanism, it's less likely to be supported or to be run properly. Local sales taxes are a bad idea. We have a great clean GST currently. A local sales tax on top of it would mess things up. Local bodies would be tempted to exempt all the feel-good stuff like kids' clothes, vegetables and the like - that makes a hash of any sales tax. Or, if it were just a levy on top of the GST implemented by local government, is it levied on all businesses in the local district? What if they're selling mail-order to folks outside of the city? What if folks outside the city are selling mail-order to those inside the city? We get all of the stupid transactions costs of implementing GST on imports except across all of the local bodies. Bad idea. One potentially interesting idea, though, or at least worth thinking about: a capitation payment from central government to local bodies. Right now, there's a pretty strong local interest group equilibrium barring development. Homeowners oppose any densification near them and any sprawl on the urban limits because of the reduced amenity value to them and because more houses would reduce the value of their houses. So the nay-sayers hold sway. But imagine if we had a transfer from central government to local government based on the number of people living in the jurisdiction. Do a better job of attracting more people to your city or town and your budget increases. That could provide at least some counterveiling force to the current "don't build anything anywhere ever" pressures. The New Zealand Initiative suggested something similar last year: a payment to local councils from central government for each new dwelling built in their area where that dwelling was able to be built within a specified time from initial consent application. These kinds of things are worth thinking about. Land use issues are pretty badly messed up in New Zealand. Most of what LGNZ's here proposing will substantially worsen things. And all because they're scared of having the soon-to-be-elderly take out reverse-mortgages. * Otherwise you get the inevitable sob story about the widow forced out of her house because she wasn't on the title. We are not concerned with the ultimate reconstruction of the patient. We are concerned only with getting the kid out of here alive enough for someone else to reconstruct him. Up to a point we are concerned with fingers, hands, arms and legs, but sometimes we deliberately sacrifice a leg in order to save a life, if the other wounds are more important. In fact, now and then we may lose a leg because, if we spent an extra hour trying to save it, another guy in the pre-op ward could die from being operated on too late. Our general attitude around here is that we want to play par surgery. Par is a live patient. This seems to be a general principle: Processes that have evolved as useful heuristics to satisfice in normal times based on the precautionary principle—the cost of a small delay is small relative to the cost of a mistake whose effect will last for a long time—may need to be replaced by discretion when situations are critical and the costs of delay are become large. The meatball principle can be applied to administrative processes following a natural disaster like an earthquake. For example, careful consent processes and restrictions on the types of housing development that can occur might make sense in normal times: Once built, an inappropriate dwelling by some value judgement will stand for a long time; it might be worth erring on the side of caution in terms of what types of buildings are approved and in taking time to make a consent decision. After a natural disaster, however, the costs of delay can be huge. There are multiple equilibria in which a city could come back stronger than before or permanently move to a more depressed state, based on self-fulfilling prophesies of investor optimism or pessimism. In that environment, delays in providing sufficient housing to make the city affordable for rebuild workers and others, and delays in providing certainty about what land is subject to compulsory purchase, are not appropriate application of the precautionary principle; they are potentially decisions akin to letting the next patient die while trying to save the first patient’s leg. Similarly, in normal times, there is some sense to universities having very careful procedures for approving new courses and programmes, even if that means 12 month delays in getting the new programmes started. But a university on the cusp of either a virtuous cycle of increased student enrolments and investment in new programmes and facilities or a vicious cycle of reduced numbers and further retrenchment needs to think in terms of meatball surgery rather than the precautionary principle. I hope the city and university leaders in Christchurch have read M*A*S*H. We really need a meatball rebuild. Kid school form, listed ethnicity as "geek", "Jedi". Wife didn't appreciate secretary's quizzical look. In future must hand those in myself. I'd filled in the form, Susan had handed it in. Fast forward a year. Yesterday we had a parent-teacher interview. Ira's teacher asked us to check over his form to make sure his details were correct. One of them wasn't. And so I tweeted this this morning. I was confused why the school had our son listed as "Greek". Then I remembered that I wrote "geek" on the ethnicity line at enrollment. But SystemD helps me see the violence inherent in the system. Eric,I'm afraid your comment on NZ occupational licensing is not correct. You can see the official list here.This just refers to regulations that have a specialist body. (Even so, it includes Real estate agents!) You will find many interesting anomalies in the way these organisations work. For instance, of particular interest to a Cantabrian would be the building regulatory bodies that have set up a system that means the average age of an apprentice is 28 (twenty eight). There is no overview whatsoever of how these bodies go about their regulatory task. Such overview is not about specialist knowledge, but simply asking those organisations how they implement legal obligations to protect consumers. e.g. I do not know how to be a dentist, but they could be obliged to show how they assess patient safety and the criteria they use to decide whether or not a procedure could safely be done by a non-professional. No regulatory body in New Zealand is asked to do this.However, this is scratching the surface. The two tricks in New Zealand are highly restrictive "health and safety" laws that in practice exclude many low skilled people from jobs because they have not done low value courses costing a few hundred dollars. Low cost to you and me, high cost to a kid on welfare if they have no guarantee of a job. The other restrictions are demanding academic qualifications. Three decades ago it was possible to be an an academic with a masters degree. Now a PhD from an overseas university is needed. That's what I call a restrictive practice! I last week also discussed how doctor licencing in New Zealand works to support what's effectively a cartel. I don't know how binding a barrier any of these licensing requirements prove in practice. It would be a pretty interesting research project for someone like the New Zealand Initiative to find out. But in all of these with which I've had any experience as consumer, the barriers here seem lower than those in the States, with evidence mostly coming from prices. Here's one example. Dentists are pretty cheap here relative to the US. I typically pay about $150, including GST, for me and the two kids when we get a check up and cleaning - we have no dental insurance, and there's no kid subsidy. * This survey of NZ dentist fees says an exam and x-ray is $95 and a filling is $160. Susan had a root canal, under sedation, for about $600. Dentistry is an undergrad degree here with a registration exam after your degree. In the US, it's a graduate degree after a biology-heavy undergraduate programme. Here's the US recommended undergrad prep for entry into dental school. Raise the entry bar, you lower the number of people passing through and so hike the fees. Dentistry still does have restricted entry: the only school in the country allowed to teach it is Otago, and they only take 54 domestic students per year. But foreign dentists are allowed to practice here; I have no sense of how onerous the examination and registration requirements are for those wishing to do so. While I agree with David that we'd do well to have a much better sense of the scale and severity of occupational licensing here, it's also worth noting that the problem's really rather worse in the States. Colorado's list** includes acupuncturists, addiction counselors, athletic trainers, barbers, funeral home operators, massage therapists, private investigators and social workers, for example. Don't try braiding people's hair for money in Utah, or many other states. Here's the Reason Foundation's work on occupational licensing. Kleiner and Krueger estimated that 29% of employed Americans were fully licensed by the government for work in their profession; licensing brings a 14% wage premium. I wouldn't be surprised if the wage premium in New Zealand were on that order, but I would be pretty surprised if the proportion of Kiwis working under occupational licensing were over 20%. File under future honours projects. * There is a no-cost-to-patients dental service for kids, but we don't use it. We don't want to clog up the public system when we can afford to pay and I don't want the hassle of having different appointment times for me and for the kids. For a while, we kept getting voicemail from the government-provided dental service. They sounded pretty annoyed that we're not using their service. I'd left a message on their voicemail saying the kids are with our family dentist; that didn't stop the calls. I don't know whether our message didn't get through to them or whether their KPIs involve having all kids seeing a government-provided dentist rather than just seeing a dentist. There's also cheaper medical visits in general for those qualifying for Community Services Cards, eligibility for which is based on household income. The price I'm quoting is the full-price, no-subsidy version. ** Not trying to pick on Colorado: they just came up first on a Google search. Two! Two! Two bad policy ideas in One!